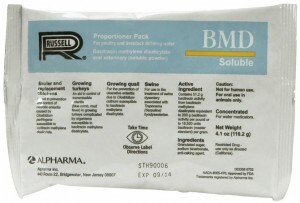 In the broiler and replacement chicken, BMD Soluble is used as an aid in the prevention and control of necrotic enteritis caused by Clostridium perfringens. In growing quail, it is to be used for the prevention of ulcerative enteritis due to Clostridium colinum. In swine, BMD Soluble can be used in the treatment of swine dysentery (bloody scours) associated withTreponema hyodyseteriae (not for swine over 250pounds). In growing turkeys, use BMD Soluble as an aid inthe control of transmissible enteritis (blue comb, mudfever) complicated by organisms susceptible tobacitracin methylene disalicylate. All of the above organisms must be susceptible to bacitracin methylene disalicylate for effective treatment.